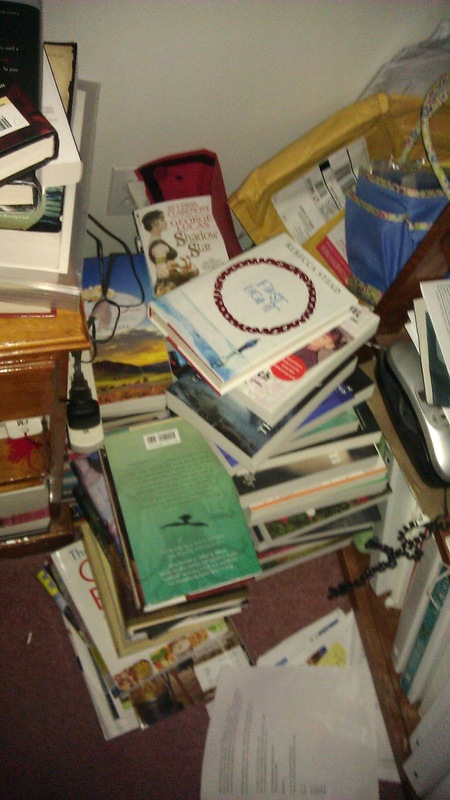 So I got it into my head yesterday to finally do something about the piles and piles of books on my floor. I had no idea what I could do, but I thought maybe I could shuffle things around a bit. And of course I thought maybe you'd enjoy seeing the process. 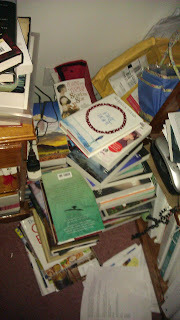 I've shared my crazy TBR shelf many times, but here, once again is a shot of what I was dealing with. On the floor is four quite large stacks. I'd forgotten what was even in there! I wanted to get them out again to see what needed immediate reading attention! So I took the already read pile, the random pile and the books I want to read, but not right away pile, and carried them downstairs to the big shelves…. where I plopped them on the tables and haven’t dealt with them yet. I’m worried about actually shelving the “want to read someday” pile because then I’ll forget about them! 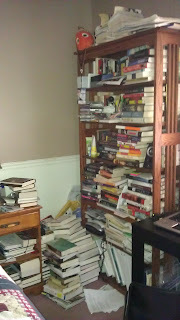 Anyway, I wonder if I’ll find room on the shelves down there for books I’ve shuffled to that spot! Maybe I'll tackle that one today. The books I want to read soon, the Utah author books and the forgotten review books, I just stacked back on my shelf in front of the long forgotten TBR books that are always in the back! Oh, and there is still one small floor stack. So, does it look any better? Now, I wonder how long it will take for me to accumulate another massive floor pile! Oh, and as much as I love my TBR shelf and all the treasures it has in store for me, I really hate this corner of my room. It needs something. A plant maybe? Some sort of picture on the wall? Gah, if I'm going to keep taking pictures of it to share, I need to spiff up my boring corner!! I really wish I had room for a lazy boy chair too, but no such luck. I love reorganizing my bookshelf..although it often turns out to be a much bigger job then I first anticipate...the last time I went through it I spent a three days putting them back on the shelves :P Nice work though! Looks good! Natalie: I could be more thorough and then it would maybe be three days. What I really need to do is take down some of the books that are in the first layer on the shelves that have been totally forgotten about. Good to see the Koontz books on the "Want to read ASAP" pile ... you signed up for the challenge after all ;-)! Oh dear. I could take some off your hands and then when I bring them back after you've forgotten them you can curse me. ;) Happens to me all the time. Who needs a picture when there's books to look at? Nicole: Yes, you see it! That one I've always wanted to read, but alas, it's not on my priority list at the moment. My first reaction when I saw your pile of books was... Wow! Wow! I also really enjoyed First Light. I hope you like those books. I too need to get to The Wise Man's Fear. Why have I not read it yet? Hmmm. So fantastic that you have so many authors from your state that you want read. Ibeeeg: Scary, I know! I think The Wise Man's Fear will really happen for me this next month. Really! I forgot to add...your end results looks fantastic. Nice job. I have a bookcase with two shelves dedicated to those books that I want to read sooner than others in this house. I go to that shelf first to pull off potential books for the month. My e-reader seems to be getting a bit wild with unread books, I am trying to stay conscious of that when choosing books to read for the month. This makes me feel so much better about all of my piles! They are everywhere and yes, shuffling and reorganizing them makes me always feel better too! Amused: At least now I remember what was in that floor pile and they are now staring me in the face. Maybe I'll read them now. You have totally put my mind at ease knowing that I am not the only one with ridiculous amounts of piles of books all over the place, categorizing again and again! The sad thing ... heading to a book fair this evening that is only going to make it worse! I just can't get enough!! Tif: Yes book fairs are a problem! Luckily (I think) we have't had one to go to for some time now!